The travel snack of astronauts! My favorite travel snacks as a kid were Space Food Sticks and Easy Cheese (that's right, cheese in a can). We still bring Easy Cheese on trips - it's great for creating edible art on a cracker (if you're the type that considers cheese from a can edible). We also bring along healthier options like grapes, carrots and celery, dried fruit and nuts Trader Joe's has lots of tasty and healthy snacks). Rather than filling our car with lots of big boxes and bags of food, Judy filled Ziploc snack bags and small sealable containers with our favorite snack foods, then put a variety into sealed 1 gallon Ziploc bags. This kept the food fresh and allowed us to have a lot a variety without taking up a lot of space. The size was perfect for Ethan and just enough for us, but you could use larger containers for older kids. We put one 1 gallon bag in the glove box and the rest in the trunk. Whenever we ran out or needed some variety we got a new bag from the trunk. www.momsminivan.com - activities, games and trips for traveling with kids. www.travelingwithkids.com - internet store specializing in travel products for kids - their best feature is that the activities are categorized by age. They also have an articles section with lots of great tips. www.aaa.com - AAA members can easily create a multiple day itinerary online using Trip Tik (under "Travel by Car"). Get detailed maps with stops along the way including hotels, gas, restaurants and more. If you are planning far enough in advance, you can request a bound copy. Mom's/Parent's (i.e. MOMS Club) group websites. They can give you a locals view of kid-friendly parks and activities. While planning a trip to San Francisco we came across a great site that had detailed pictures and information of all of the parks in the city. Share your favorite family travel resources in the comments below. The first person who comments will receive a free ticket to the Long Beach Aquarium of the Pacific. Be sure to identify yourself in the comments so we know where to send the ticket. We recently went on our second big road trip as a little family, the first since Ethan (2 1/2 years old) could protest sitting in the car for hours, using actual words. In all we spent six days on the road for seven or more hours each day and had a surprisingly good time. With summer vacations rapidly approaching, I thought it would be fun to dedicate the next few blog entries to traveling with kids. Each entry will focus on a specific topic - travel tunes, snacks, activities, destinations - and you can share your favorite tips by leaving a comment under the blog entry. 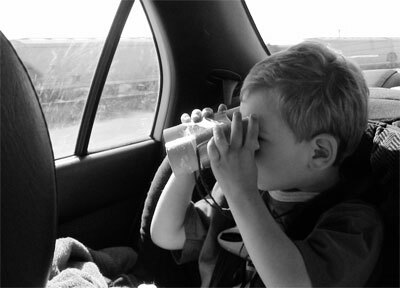 Ethan looking for some fun with his homemade binoculars.